Pygmalion (Πυγμαλίων Pugmalíōn) is a legendary figure of Cyprus, most familiar from Ovid’s narrative poem Metamorphoses. He is a sculptor who falls in love with a statue he has carved. 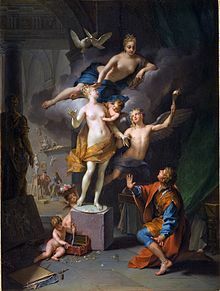 Depiction of Ovid’s narrative by Jean Raoux. Having crafted the perfect woman, Pygmalion makes offerings to Aphrodite at her festival day, quietly wishing for a bride who would be “the living likeness of my ivory girl.” When he returns home, he kisses his ivory statue, and finds that its lips are warm. He kisses it again, and finds that the ivory has lost its hardness. Aphrodite has granted Pygmalion’s wish. Pygmalion marries the ivory sculpture and they live happily together. In modern times, George Bernard Shaw’s play Pygmalion, reexamines the myth through the story of underclass flower-girl Eliza Doolittle who is metaphorically “brought to life” by a phonetics professor, Henry Higgins. Higgins teaches her to refine her accent and conversation and otherwise conduct herself with upper-class manners in social situations. The play inspired the film My Fair Lady starring Audrey Hepburn. King Cophetua and the Beggar Maid, 1884, by Edward Burne-Jones, currently hangs in the Tate Gallery, London. George Bernard Shaw’s re-telling of the Pygmalion myth also draws upon the Elizabethan ballad of King Cophetua. Titled “The King and the Beggar-maid,” the story is Cophetua, tells of an African king who one day while looking out a palace window, witnesses a young beggar, Penelophon, “clad all in grey”. Struck by love at first sight, Cophetua walks out into the street, he tells Penelophon that she is to be his wife. She agrees and becomes queen, and soon loses all trace of her former poverty and low class. In classical fairy tales, the maiden is woken from an enchanted sleep by the kiss of the Prince, just as Pygmalion, the sculptor awakens his bride, with a kiss. Moreover, Professor Higgins endows Eliza with dignity and pride, bringing her ‘to life‘ by bestowing upon her the graces of society. But these tales offer little nuance to what may occur to an unsuspecting creator once he has summoned a real life woman with agency and choice, into his life. It is not love to to fashion a person as though an object, to be pure and good, endowed with life yet with the expectation it will remain good and pure in perpetuity? A mannequin or socially engineered project like Eliza Doolittle cannot truly feel loved nor genuinely love in return under such conditions. Bernard Shaw’s play notoriously does not end with the fairy-tale love story of Ovid’s Pygmalion. Rather Eliza rebels from Higgins, refusing to fetch his slippers and he grows furious for “lavishing” his knowledge and his “regard and intimacy” on a “heartless guttersnipe” who he has made “a consort for a king.” The Hollywood film version ‘My Fair Lady’ of course rejected such a realistic ending in favour of, well a Hollywood one. 10 I clothed you with an embroidered dress and put sandals of fine leather on you. I dressed you in fine linen and covered you with costly garments. 11 I adorned you with jewelry: I put bracelets on your arms and a necklace around your neck, 12 and I put a ring on your nose, earrings on your ears and a beautiful crown on your head. However, the bride does not remain beautiful and obedient for the king. She soon rebels, turning to prostitution and idol worship and even giving her children up for human sacrifices. 15 “‘But you trusted in your beauty and used your fame to become a prostitute… 16 You took some of your garments to make gaudy high places, where you carried on your prostitution... 17 You also took the fine jewelry I gave you, the jewelry made of my gold and silver, and you made for yourself male idols and engaged in prostitution with them. The prophet continues to lament all of Israel’s misfortunes as resulting from the self inflicted chaos of Israel’s choices, a once chosen and adorned bride who chased other lovers. He closes with a reminder of YHWHs eternal promises. Soren Kierkegaard’s version of the ballad of King Cophetua, ‘The King and the Maiden’ retells the tale with the king willing to take on the clothes of a beggar to claim the woman he loves. It is he that abases himself rather than she he elevates, lest he overwhelm her with his power and grandeur and never truly claim her heart. This short story strikes at the heart of the reader, for love is true love not when the object of desire is bestowed with graces to make her worthy of love, but when she is met by the humbled heart of one earnestly and repeatedly wishing to know her win her heart, one indeed willing to suffer the pains of loving her and her imperfections and keep coming back to an eternal promise of love.